Using Lazarus 1.8.4 and FPC 3.0.4 64 bit on Ubuntu 18.04 64 bit. Project built and runs fine on dev system. the executable when compiled on Ubuntu 18.04, but how can I fix this? > Using Lazarus 1.8.4 and FPC 3.0.4 64 bit on Ubuntu 18.04 64 bit. > Project built and runs fine on dev system. > the executable when compiled on Ubuntu 18.04, but how can I fix this? Either install libgtk2.0-0 or remove the dependency. If yes, remove it or set it to lclwidgettype "nogui". >Either install libgtk2.0-0 or remove the dependency. I don't know how to "remove dependency"
there be any dependency towards X11? >If yes, remove it or set it to lclwidgettype "nogui". I had LCL there as Required package, but I removed it. not be related to X11, right? >> If yes, remove it or set it to lclwidgettype "nogui". > I had LCL there as Required package, but I removed it. > not be related to X11, right? LCL) does not necessarily mean a change in size. So you know how to remove a dependency! How did the LCL dependency come there if you created a console program? >LCL) does not necessarily mean a change in size. greeting about available updates then rebooted. > greeting about available updates then rebooted. IMHO, that's the wrong approach. You have to remove the dependency, somehow, not fulfill it. >> I had LCL there as Required package, but I removed it. >So you know how to remove a dependency! >How did the LCL dependency come there if you created a console program? today, did not make a difference. (command line) type program without GUI connections? change the main dpr file into a normal unit? On Sat, 27 Oct 2018 14:03:16 +0200, "Carlos E. R. via Lazarus"
>> greeting about available updates then rebooted. >IMHO, that's the wrong approach. >You have to remove the dependency, somehow, not fulfill it. I have an idea. Make an error in some gtk2 widget set unit. Build. Then you ll see which part of the app requires gtk2 code. >change the main dpr file into a normal unit? as a Free Pascal command line program. section to the newly created program's source file. But once done it built OK and worked as expected in Ubuntu 18.04. It should not need a display! > It should not need a display! Then remove the gtk dependency. Dependencies" to find out which one. > Had to fix sections etc in the old dpr file so it now is a proper unit. 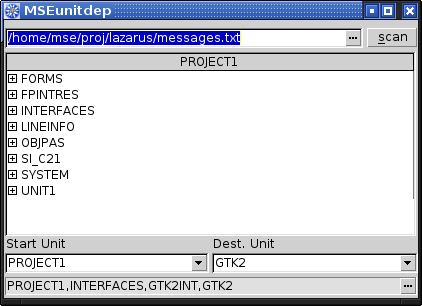 You have a .lpr file in the Lazarus project, right? Not .dpr? > But once done it built OK and worked as expected in Ubuntu 18.04. With LCL it was 7 Mb and without LCL 10 Mb. Strange. console program. It should not. If you send me a test program then I can have a look. - Compile the project with -vu, copy the message to a file. for binary types (e.g. Windows which has GUI and Console or Classic Mac OS which has Tool). Unix-like systems like Linux do not differ between console and GUI programs in that way and thus the directive is ignored(!) there. As others already wrote you should not try to fulfill twee dependency on t he server, but to remove it from your binary. For this you need to find out what unit pulls in that dependency and get rid of that. You can maybe use the Unit Dependencies window for that (see http://wiki.freepascal.org/IDE_Window:_Unit_dependencies ). Alternatively you could try to switch the LCLWidgetType to NoGUI as had already been suggested by Mattias as well and try whether that is sufficient. >> Had to fix sections etc in the old dpr file so it now is a proper unit. >You have a .lpr file in the Lazarus project, right? Not .dpr? easily and to create Unix style hashed passwords. >> But once done it built OK and worked as expected in Ubuntu 18.04. >With LCL it was 7 Mb and without LCL 10 Mb. Strange. demo licenses to people asking on our website. >console program. It should not. >If you send me a test program then I can have a look. I will try to make one from scratch and see what happens. >> It should not need a display! >Then remove the gtk dependency. Well, I took LCL out of the project and it still has these problems. >Dependencies" to find out which one. > was done it still used the dpr file as the main program source. I don't understand you. The converter creates a .lpr file for sure. > and I am not using any forms or such so there is no use for this. It is not only for the IDE integration. There are units with GUI that need LCL. > directories and I am done. bug but they cannot remove it for backward compatibility. > Not so simple in Lazarus until I saw I could install indylaz. Yes, Indy apparently suits best for GUI apps. That is not recommended normally but this is a special case. non-GUI parts to their own packages. >> was done it still used the dpr file as the main program source. >I don't understand you. The converter creates a .lpr file for sure. >> and I am not using any forms or such so there is no use for this. >It is not only for the IDE integration. There are units with GUI that need LCL. >> directories and I am done. >bug but they cannot remove it for backward compatibility. entered, which are just valid for the project itself. >> Not so simple in Lazarus until I saw I could install indylaz. >Yes, Indy apparently suits best for GUI apps. >That is not recommended normally but this is a special case. >non-GUI parts to their own packages. Here are the 3 dirs I need, Core, Protocols and System. And I also removed the indylaz package from the project dependencies. tried adding LCL back to the project required packages. Then the project built OK.
of my development machine and stay at the login screen. message and the program won't run.